They are very soft and plush and walking on them is akin to walking on clouds. 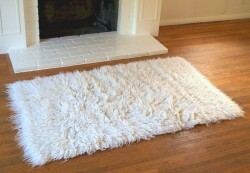 Flokati rugs are truly luxurious. They are very soft and plush and walking on them is akin to walking on clouds. These floor pieces can make your home look exceptionally stylish and classy. This is why many people are always on the lookout for Flokati rugs for sale. However your pieces should always be clean and looking their best, or else what you have is an unsightly piece of wool. How can you keep your pieces looking as great as those Flokati rugs for sale in the stores? Actually maintaining your Flokati is relatively simple. The wool fibers are naturally dirt and dust repellant. This makes it very easy to keep your piece clean as all you need to do is give your Flokati a good vigorous shake. Do this a few times a year, and of course do it outdoors. When you shake your Flokati, it will help loosen any dust or dirt trapped in between the wool fibers. Another thing you can do is to air your Flokati pieces outdoors. Wool fibers breathe and airing it outdoors helps it to breathe better. Being placed indoors makes your rug absorb the indoor odors, so airing them outside will eliminate odors. Just make sure you do this in a shaded spot and not under direct sunlight. You can also try washing your Flokati. If you have a small piece, a run through the gentlest cycle on your washing machine can is acceptable. If you have a large piece you can use a spray bottle and lightly spray cold water onto the surface. Then hang your piece up to dry. The Flokati needs to be absolutely dry before you can use it again. You can even brush out the wool fibers with a metal brush or a dog brush. Brush from the centre out. This will help make your Flokati full and plush again. If you take care of your Flokati rugs well, you will be able to use it for many years to come.